A significant improvement over the old ice bag, the Thera-Med Cold Pack uses a hypoallergenic vinyl pouch filled with an advanced patented Crylon Gel which stays flexible even at freezing temperatures. 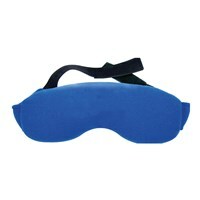 This keeps the soft pad pressed firmly against your neck for maximum effectiveness and comfort. It stays colder than an ice bag and the attached Velcro strap holds it securely in place. Provides up to 30 minutes of healing cold therapy to help relieve pain and reduce swelling from sprains and strains, muscle spasms and arthritis. Easy to use: Store in the refrigerator or freezer (depending on your tolerance for cold) until first sign of pain or swelling, then place over area of discomfort. Cooling area (band) is approximately 10 Long x 5 Wide. Blue.